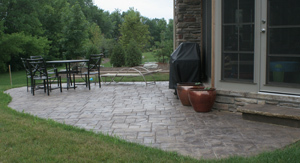 We provide residential and commercial concrete services, products and flatwork. Unsure what you want done? We'll work with you to customize your concrete project and can provide a tour of our past projects to help you visualize our end-product. Established in 2002, we are a family owned & operated concrete flatwork and construction company here in the Fox Valley. We provide services throughout Northeast Wisconsin and upper Michigan. Our motto is "Where ever you need us, that's where we go". We are a fully licensed & certified construction company and specialize in residential & commercial concrete flatwork and residential attached or detached garage construction. Our goal is to provide our clients with a high quality product, and a positive customer experience that goes above & beyond. Our team is lead by Tim Hippert (owner), who earned his degree in engineering, is certified by the American Concrete Institute (ACI) and has over 25 years of concrete and construction experience. With so many options and choices to make, I would be happy to meet with you and discuss your project. Contact us for a free, no obligation, estimate.